Unfortunately, this means neglecting many highly important metrics – thus preventing you from seeing the true marketing power of social media. What this also does is it makes you only looking at the short-term results social media is generating. Sure, metrics such as brand awareness and trust-building eventually leads to more sales. But those often happen long after the social media ROI evaluation is done. Leading to social media not getting the credit it deserves. In this article, we’re looking at 4 Social Media Metrics your Brand is Forgetting About (And Why They’re Important) to bring into the equation. While it’s close to impossible to measure brand awareness in volume or how much your brand will make from it in dollars, there’s no doubt that social media generates a ton of it. That’s also why many marketers are ignoring it. However, that’s far from a valid reason to why you shouldn’t put thought and effort into at least trying to measure it. 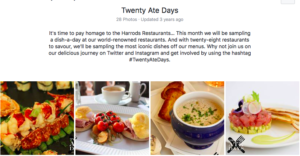 A case study of Harrods’s social media campaign “Twenty Ate Days” which featured a new restaurant everyday throughout the month of February of the 28 restaurants situated in the Harrods department store found interesting facts about the results they were able to generate. The case study described Harrods’s social media efforts, and that those in charge took brand awareness with great seriousness – even though it can seem like fairy dust because of the fact that you don’t actually have anything to bite in. Harrods’s aims of the campaign was to “achieve positive publicity about the business, build image and enhance reputation in terms of products and services”. Something that is also worth mentioning is the correlation between brand awareness and brand image. These to are very well connected and are both built at the same time. With social media, you have tremendous opportunity to present your brand just the way you like it. With social media, you can reach and impact your audience with the help of both visual content and the written word. And by creating a theme that suits your brand’s values, you make sure the brand awareness you build is accordance with how you want people to view it. Every time you receive a “like” on your post, and every time someone stumbles across your social media account, brand awareness is built, and people who had never even heard about your business now gets your logo and brand etched into their brain. Bottom line is: don’t neglect brand awareness, reputation, and brand image. And it’s happening with every single post you share, and every single conversation you have with your audience. Something that is often forgotten when looking at the results of social media is relationships built thanks to it. Relationships with your customers lead to customer retention. Something that we’ll go more into detail on in the next point. People have a hard time speaking to faceless brands without personalities, but since social media lets you speak to your audience in a very relaxed way, you can chat with your customers in a less formal way that comes of as more natural and genuine. And that’s exactly what social media do. He also brought up that these conversations may seem like a waste of time, but in reality, they lead to real business for him. And they probably do it for you too – whether you know it or not. No, business partly won’t happen over night, nor if you force it. Business usually coms when you connect with people and have genuine conversations with them. Because after all, that’s what social media is about. As a brand, you’re always in the hunt for new customers. 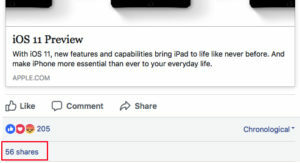 But what about those you already have? The statistics speak very loudly about the importance of about customer retention. Thankfully, social media is a powerful tool that helps you achieve just that. The probability of selling to an existing customer is 60-70 percent. At the same time, the probability of selling to a new prospect is 5-20 percent. 80 percent of your future profits will come from just 20 percent of your existing customers. Of the total business a brand has, 65 of it comes from existing customers. This just goes to show how important customer retention is, and if you don’t factor in the fact that social media , you won’t be able to fully understand how beneficial really is for your business. When you’ve successfully converted a person into a customer, what is it that will make them return to your brand and buy from you time and time over? It’s having constant dialogues that help improve your relationship with them, and increase their trust in you. …And, making sure that you are always on top of their mind and never forgotten, that will. All of these things can be achieved with social media. 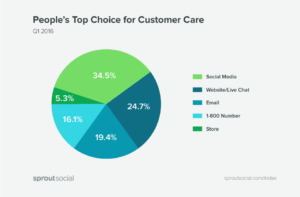 While the statistic below tells us about customers’ top choice for customer care, it speaks for a trend that a large share of customers takes their brand outreaches to social media. The reason to this is because social media offers a seamless one-on-one interaction between brand and customer. If you know that you regularly handle customer questions, inquiries, and have conversations with people on social media, you can be sure that you’re increasing your customer retention rate. But are you taking that into account when evaluating your social media? How much your social media has increased your retention rate is, of course, difficult to measure. Also, you’re probably starting to see a relationship between the metrics that marketers tend to forget about in their equations, and the nature of those that are left out. 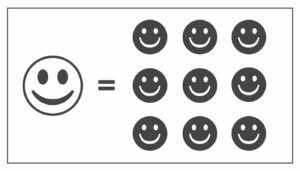 Now, as you know, you can’t measure customer retention by counting the people who have said “I have become a returning customer because of your social media.” because let’s be honest, it doesn’t happen. I’ve already gone into customer interactions a bit, so I’ll focus on loyal followers. If you’re active on social media, you’ve probably accumulated a few loyal followers. Chances are, these are customers of yours that are true #1 fans of your business. These individuals are easy to spot because they can be seen commenting on virtually every single post of yours – cheering and encouraging your brand. Social media gives them a safe zone and a go-to source when they want to interact with your brand, that not many other forms of brand outreach does. Shares and mentions of your brand on social media are essentially the digital equivalent to word-of-mouth marketing. Both in terms of measuring – and the power of the word-to-mouth. When someone talks to a friend about a good experience they had with your brand, they only share their story with one person. What’s true is that the number is highly limited. In fact, one happy customer will tell 9 of their peers about their experience. However, when they take their recommendations to social media, it’s a completely different story, making it possible to reach hundreds, maybe even thousands of their peers – all at once. When a supporter of your brand loves your brand, they’ll tell their friends about it. When your brand is active on a social media platform, it works like a discrete way of encouraging them to talk about your brand on that platform. Partly because they know you are there to listen to them. When you look at the fact that consumers are 92% of people are more likely to trust their peers over advertising when it comes to purchasing decisions, it gets quite clear that peer-to-peer marketing on is tremendously valuable for brands. Therefore, this is a metric that you simply cannot afford to ignore. You’ll be happy to hear that measuring this is easy compared to the other points. 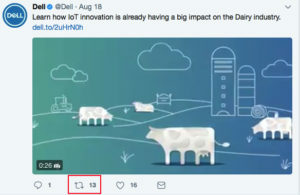 If you’re using social platforms like Facebook or Twitter, you can see the exact number of people who have retweeted or shared your post – and the names of the people who did. Another way to see conversations happening around your brand is to search hashtags for your brand. Thankfully most social platforms have this, which makes the social scanning a whole lot easier. Simply go to hashtags on the platform you use and search for your brand’s name (or your product’s name) depending on what your customers uses the most. When identifying them, you can thank them for their support and trust in your brand, and evaluate what praises you are receiving. There are many metrics marketers fail to include when evaluating their social media marketing success. Partly because they believe there’s no effective and accurate way of measuring them, and partly because they simply aren’t aware of all the results social media is generating. By being more aware of the true power social media has – apart from direct sales, likes, and increased traffic, you’ll get the full picture of what your social marketing efforts really result in.